In our previous tutorials we came across what is Dependency Injection and how to implement it in Spring using Spring DI capabilities. We came across 'Spring DI using Setter Method' and 'Spring DI using constructor parameter passing'. In this particular blog we w'll come across how how to implement and use Spring DI with Setter Method, Constructor Argument passing and @annotation together in a single spring MVC application. Before we start let's take a look at overall project structure for today's discussion. We have added three general purpose java classes to make it clear of Spring DI implementation. The three classes are used to show easy implementation of Spring IOC using Setter Method, Constructor argument passing and @annotations methods. 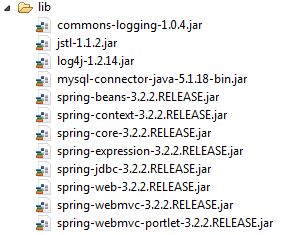 Here is a list of all jar files used to implement Spring DI. Here is step by step configuration and implementation in details. This is an old web.xml file to tell the container that all upcoming requests are going to be handled by spring itself. This is the core of all spring web applications, all spring based DI configurations and bean declaration goes here in a single file. This file shows what we need to add in order to implement and inject beans in spring container. This is a simple jsp file that is being used as welcome file, we have added a link here that w'll call the appropriate controller method to fire the actual stuff. Here we have injected 'UserDaoImpl' class reference in Controller class. To do so all we need to do is adding a bean entry of injected class (i.e. UserDaoImpl) in SpringContext.xml and a reference variable of related interface in injecting class (i.e.HomePageController ) annotated with @autowired. This is simple spring controller, required method is annotated by @RequestMapping and the implementation code goes under the method. Here we have injected 'UserServiceImpl' class reference in 'UserDaoImpl' class. To do so all we need to do is adding a bean entry of injected class (i.e. UserServiceImpl) and passing this bean reference to Injecting class bean(i.e UserDaoImpl) as argument in SpringContext.xml . We than need to add a reference variable of related interface in injecting class (i.e.UserDaoImpl) along with a setter method. This is a simple java interface having a simple test method, the implementation of the method goes under implemented class for the same. This is a simple java class that is going to be used as a bean to demonstrate DI methodology in spring. Related interface's method is implemented here to print a simple text string on console. We will inject the reference of this bean in 'HomePageController' using @autowired annotation. 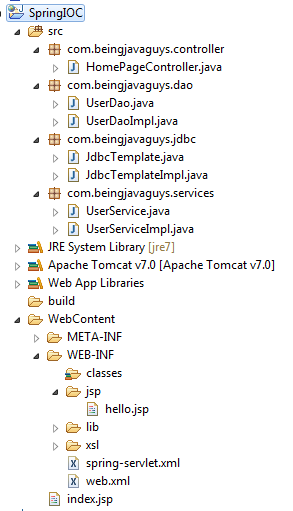 Here we have injected 'JdbcTemplateImpl' class reference in 'UserServiceImpl' class. To do so all we need to do is adding a bean entry of injected class (i.e. JdbcTemplateImpl) and passing this bean reference to Injecting class bean(i.e UserServiceImpl) as constructor argument in SpringContext.xml . We than need to add a reference variable of related interface in injecting class (i.e.UserServiceImpl) and pass JdbcTemplateImpl as an argument in UserServiceImpl's constructor. This is a simple java class that is going to be used as a bean to demonstrate DI methodology in spring. Related interface's method is implemented here to print a simple text string on console. We will inject the reference of this bean in 'UserServiceImpl' using constuctor argument passing method. This is a simple java class that is going to be used as a bean to demonstrate DI methodology in spring. Related interface's method is implemented here to print a simple text string on console. We will inject the reference of this bean in 'UserDaoImpl' using setter method implementation. If everything goes right and you did accurate configuration, you will see the hello.jsp file up in browser and a series of strings on console from different classes. 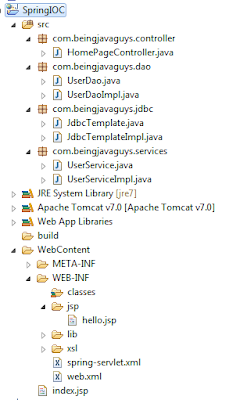 In this particular blog we came across how to implement Spring IOC - Using Spring DI with Setter Method, Constructor Argument passing and @annotation together in a single application. In upcoming blogs we will see more about Spring and other Java Technologies.